D.C. Everest was one of Central Wisconsin’s most influential and prominent business industrialists. 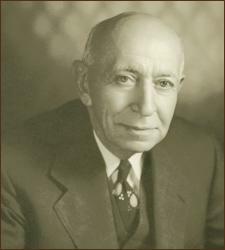 From 1909 until his death in 1955, he served more than 46 years as general manager, president and chairman of Marathon Paper Mills Company which became the Marathon Corporation, a specialty paper company that played a leading role in the growth of America’s food packaging and printing industries. Under Everest’s leadership, the Marathon Corporation grew from a vacant site on the Wisconsin River bank in Rothschild to nine paper mills and converting plants in the U.S. and Canada with annual sales of $300 million annually. In 1957, the Marathon Corporation merged with American Can Company. D.C. “Clark” Everest was born in Pine Grove, Michigan in 1883 and entered the business world at the age of 16 after a fire destroyed his family’s manufacturing firm. He worked his way up from office boy to manager at paper companies in Munising, Michigan and Chicago. In 1909, at the age of 26 he was hired by Neal Brown and a group of local investors known as the Wausau Group to set up and manage a new paper mill in Rothschild. Everest’s extraordinary management skills quickly earned him his own place in the Wausau Group, and he played a major role in the development of many other area companies. He was a founder, vice president and director of both Employers Mutuals of Wausau and the Masonite Corporation for many years. He served as president and chairman of Wausau Paper Mills, helped organize Marathon Electric Manufacturing Corporation and owned or managed many other paper, timber and mining companies in the U.S. and Canada. D.C. Everest also shared his leadership skills with non-profit organizations serving as president, director or chairman of the Wausau Chamber of Commerce, the Wisconsin Valley Improvement Company, the American Red Cross, the National Council of the Boy Scouts of America, the Wisconsin 4-H Club Foundation, the Wisconsin State Historical Society and the Marathon County Historical Society…to name just a few. He was a staunch supporter of local education. In 1952, the D.C. Everest Junior and Senior High School in Rothschild was named in his honor. Everest’s technical contributions to research and product development in papermaking and packaging are legendary in the American paper industry. Everest was elected twice as president of the American Pulp and Paper Association and was one of the founders of the Institute of Paper Chemistry in Appleton which is now the Institute of Paper Science and Technology in Atlanta. In 1944, he received the prestigious national Gold Medal Award from the Technical Association of the Pulp and Paper Industry for his technical contributions to the industry. Everest was also made a Fellow of Great Britain’s Newconmen Society, an honor in the field of engineering. Everest achieved national prominence as a leader in conservation. He was a founder of Trees for Tomorrow and served as president of the American Forestry Association. In 1994, D.C. Everest was inducted into Junior Achievement’s Wisconsin Business Hall of Fame. Junior Achievement of Wisconsin’s North Central District is proud to honor D.C. Everest as a 2009 Champion of Business.